The summer of 2017 was extra special for me in a number of ways, not the least of which is that with the blessing of St. Andrew’s Elders and Board of Directors, I was able to weave three weeks of annual vacation and a little less than five more of sabbatical leave for the purpose of rest, reflection, study, and spiritual refreshment. My time away began on July 10th and continued through September 1st. It included family time, walks around the lake near our home, reading sessions with David in a local coffee shop, a vacation with Patty, a trip with Lauren, and big news from Andrea. It also took me to a number of churches and other places I’ve wanted to visit and to learning experiences that blessed me richly. It was a good time in the Lord and I’m truly grateful for the chance to stand down for a while prior to another season of ministry that will be in full swing by the time you read these words. I also want to thank St. Andrew’s leaders and staff for their faithful service while I was gone. As an expression of accountability for the time you allowed me to have away from our congregation, allow me to share my reflections on the places I visited and experiences I had during my summer sabbatical. I also make this report with the hope that it might inform your understanding of what author Trevor Sutton calls the difference between “Sabbath rest and mindless amusement.” While I confess to having experienced both during July and August, I also testify to the power of finding God in many new places and in fresh new ways. Amazing Grace Lutheran Church is located in the inner city of east Baltimore. It has been described as “a real church in a real hood.” Drug deals have taken place in its shadow. On the Sunday I was there a Baltimore City official came with information about ridding your house of rats. And yet, Amazing Grace is a place that is full of hope and life in Christ, where a culturally and economically diverse congregation gathers to worship God, honor and support each other, and serve the community around them. Officially, the congregation calls itself “a multi-cultural come-as-you-are community committed to being a place of hope and healing in East Baltimore, connecting people with the life changing power of Jesus.” And by all indications, that’s what it is. The area behind the church has been transformed into an urban garden where vegetables are grown for church members and neighbors in need. Its back wall has a giant mural painted on it depicting the lion and the lamb together. A labyrinth invites people to pray and reflect on the God who enters our broken world and walks by our side. Their “Amazing Kids” after-school program operates on weekdays during the school year. And the sense of authentic community at Amazing Grace was so evident in the service our son David and I attended that we left agreeing that we would not soon forget our experience. The problems of inner city Baltimore have not disappeared. But Amazing Grace is right there in the midst of them doing the work of Christ. This little church is making a big difference for the kingdom, and more churches of all sizes need to be like it. Southeast Christian Church in Louisville, Kentucky, by contrast, is one of the largest congregations in the nation, with a weekly worship attendance of more than 21,000. It is known not only for its size, even among mega churches, but for being multi-site, which is to say that Southeast Christian is one congregation meeting in five different locations throughout the greater Louisville area and across the river in southern Indiana. Founded in 1962 by a few dozen visionary followers of Jesus, Southeast continues to serve at its best known location, which now includes a 105 acre campus, a sanctuary with seating for thousands, a “commons” larger than a football field, and 91 Sunday School rooms for children. 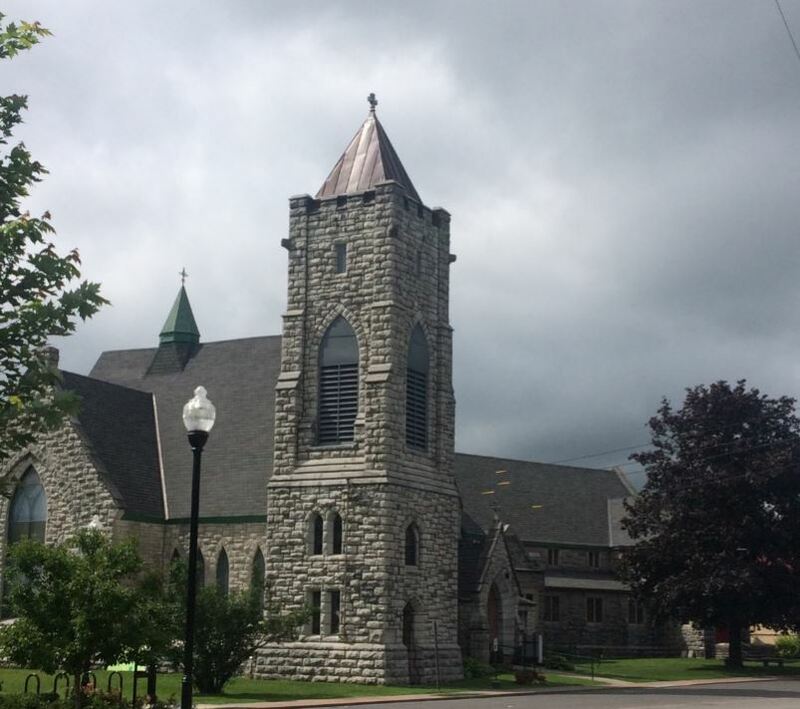 And yet, in just the past ten years, the congregation has established four additional sites and now describes itself as a “unified multi-site community” on the mission of connecting people to Jesus and to one another with Him at the center of everything. The leadership, organization, and message are all centralized, though each site has its own unique set of responses to the needs of the communities in which they serve. Southeast Christian Church is growing not just by addition but by multiplication. It was exciting to visit a church where so much continues to happen for faith and for God. Trinity Episcopal Church is located in the Finger Lakes Region of New York next to a canal in the town of Seneca Falls, which was the apparent inspiration for the fictional Bedford Falls in Frank Capra’s 1946 movie “It’s a Wonderful Life.” Capra described the movie, which you can still catch on TV at Christmastime, as a conflict between “loving thy neighbor and devouring thy neighbor in which the weapons are a bank full of money against a houseful of love.” With the message of Jesus, churches like Trinity continue to address conflicts like that to this day. Seneca Falls is also the birthplace of the Women’s Rights Movement, which held its first convention there in 1848. Patty and I visited Trinity during our vacation and were struck by the beauty of the 1885 sanctuary, which according to our host is the second most photographed church in the state of New York after Manhattan’s St. Patrick’s Cathedral. Of special note are the church’s stained glass windows, two of which are works of the American artist Louis Tiffany, who signed one of them shortly before his death in 1933. It was no coincidence, we were told, that one of the most prominent windows in the church is the Easter window depicting the women at the tomb of the Risen Christ. It was an intentional selection given the history of their town. Who knew that a little place would send such large messages? Luther Place Memorial Church in Washington DC was founded in 1873 as a memorial to peace and reconciliation following the Civil War, and those powerful words remain in the congregation’s DNA. 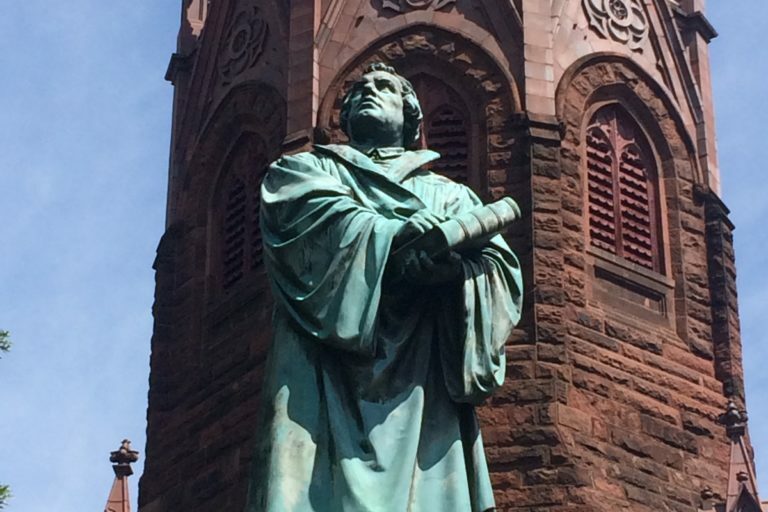 According to its website, a statue of Martin Luther at the church’s Thomas Circle location was dedicated in 1884 on the 400th anniversary of Martin Luther’s birth with more than 10,000 in attendance. From its earliest days, the people of Luther Place advocated for African-American rights and operated a free infirmary that in 30 years served over 25,000 people. In the 1960’s a coffee house was operated out of the church basement and included performers like Roberta Flack. During the 1968 riots after the murder of the Rev. Dr. Martin Luther King, Jr., Luther Place was kept open and sheltered, fed and clothed more than 10,000 persons in need. And in the 1970’s the church founded N Street Village, a continuum of care including shelter, case management, substance abuse treatment, and employment services for homeless women. 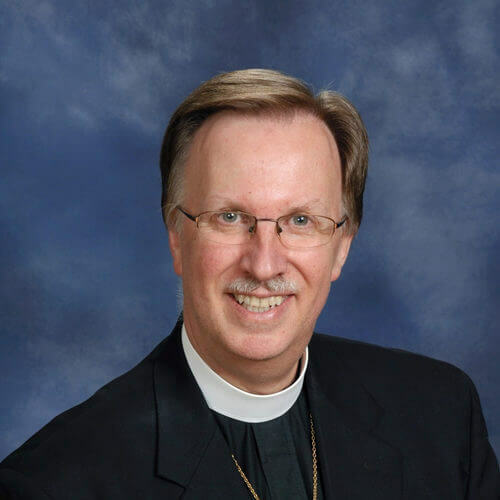 All of it has emerged from a Lutheran parish ministry for all people. During more than 30 years of serving in the Baltimore-Washington area, I’ve certainly known of Luther Place. 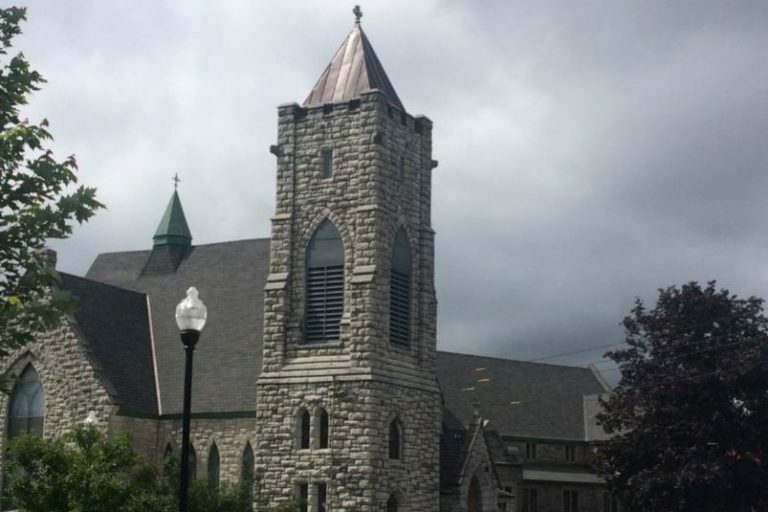 But until my Sabbath visit this year, I never had the chance to worship there and further connect with its history. Doing so helped me to fill in a very important chapter in the story of Lutheranism in our nation’s capital. The Hillsong Church is an Australian born mega-church which numbers more than 100,000 weekly attendees at 80 affiliated local congregations around the world, including one that currently meets in the Hammerstein Ballroom of the Manhattan Center in New York City. 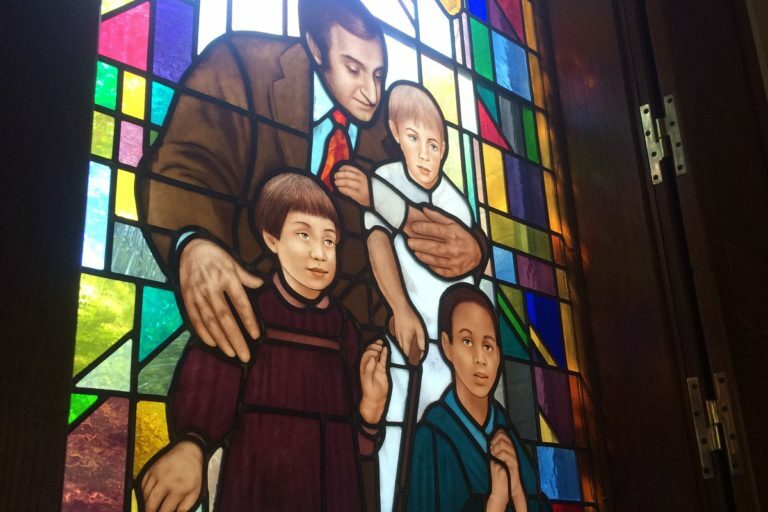 I’m told that 70% of those at the New York church are under the age of 30, and I can assure you that on the day we attended I was definitely among the oldest dudes in the room. In fact, I learned that Justin Bieber worshiped at the early service that day, which I share in case you want to check out the early service at St. Andrew this fall, since you never know who you might run into. At Hillsong, people stand in line along 34th Street to get into one of its four Sunday services. Worship includes many of the songs you hear on Christian radio and several of which we sing at our contemporary worship. And while the atmosphere was not unlike a well-produced rock concert, its substance and purpose are worship and praise, which were emphasized by the pastor when he issued a warning that those who see Hillsong Church as nothing more than “Christian karaoke” are missing the biblical truth of what following Jesus is really all about. It’s a good point and one that, in my opinion, also applies to those whose worship habits and musical tastes are of a more classical nature. In the words of nationally known pastor Craig Groeschel, “authenticity trumps cool every time.” That said, not only was I struck by the thousands who lined up for the 12:30 service on a gorgeous Sunday afternoon, it was also clear that authentic faith is very much alive in a place that is reaching a generation of young believers and seekers who are largely absent from mainline denominations and their affiliated congregations. Our Saviour New York is a multi-site Lutheran Church with one of its two locations just 23 blocks north of Hillsong in a section of Manhattan still known by many as “Hell’s Kitchen,” though I’m told that others now include it in the more appealing term “Midtown.” The other location is in the Rego Park Section of Queens. Our Saviour-Midtown rents a late 1800’s church building on West 57th Street that was given to our denomination’s Atlantic District. 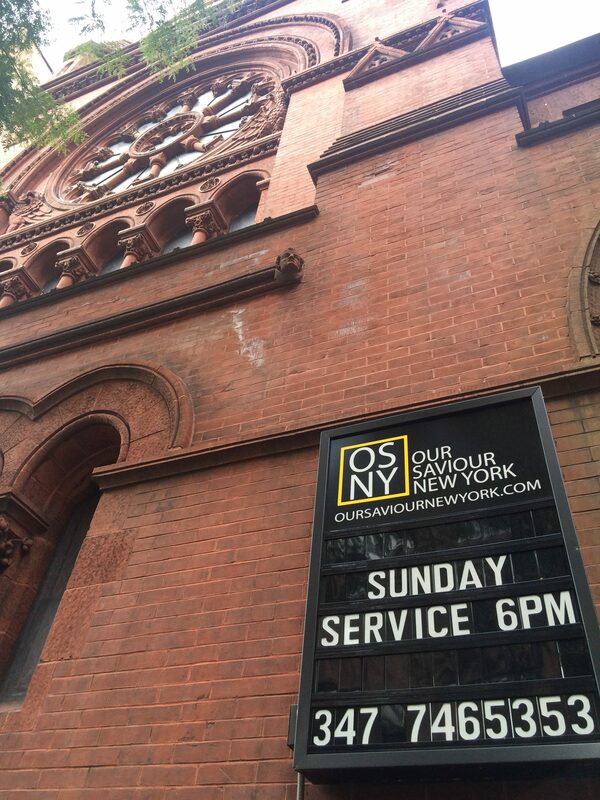 There is a morning service in Queens and a 6 pm service in Manhattan, with a combined weekly attendance of about 125. With some variations on the theme, the worship most resembles St. Andrew’s Monday evening service. It is biblical and sacramental. Symbols of the past and future combine in an old sanctuary outfitted with video screens, room for musicians, up-to-date lighting, and a place for fellowship in the back since the entry halls of many old churches come with room for little more than an umbrella stand. Though different from the worship experience we had at the Manhattan Center, Our Saviour-Midtown offered several important insights into the mission of the church today. One is that multi-site ministries (one church in more than one location) aren’t just for mega-churches, at least not at Our Saviour. Another is that while large gatherings of believers can provide a powerful witness, so can smaller ones when Christ and His word are at the center of that church’s worship and mission to a particular community. 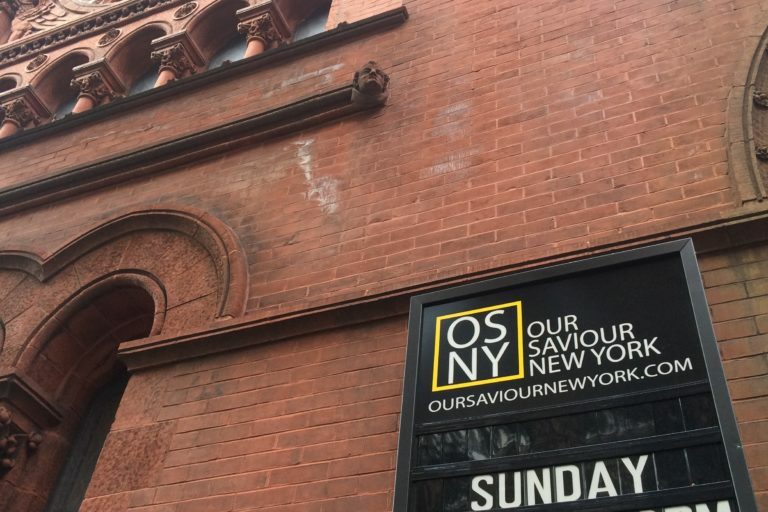 The sense of community at Our Saviour was evident and there’s no doubt in my mind that this church is reaching people who would not find their way to Queens or to Hillsong or any other church in Manhattan. But they have found the Body of Christ in a community that is small, growing, and by all indications is there to stay for the sake of those who live in a place known historically as “Hell’s Kitchen.” If I lived there, I would go to Our Saviour-Midtown. OTHER STOPS ALONG THE WAY…. The National Civil Rights Museum has been on my bucket list for years. But since I’ve had no other occasion to visit the city of Memphis where it is located, I decided to use some sabbatical time to go there on purpose and was joined in my travels by our daughter Lauren. We were not disappointed. 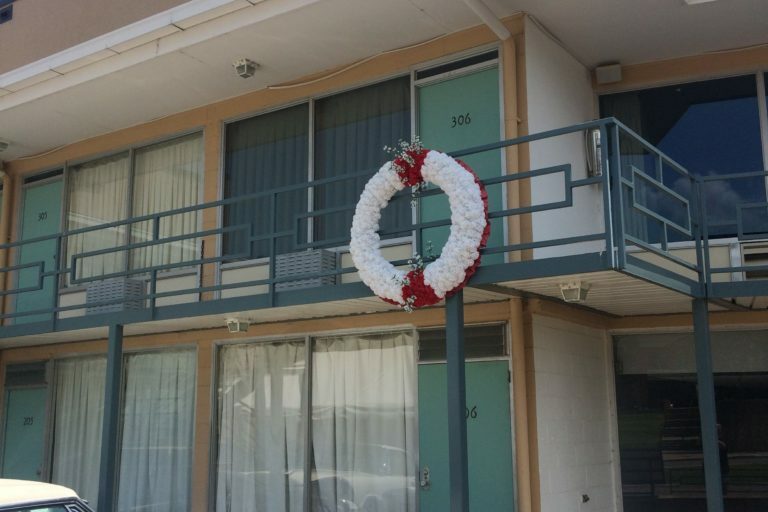 It is a powerful place that invokes difficult memories of the unthinkable disgraces of slavery, segregation, and racism in the American story, and is literally built around the Lorraine Motel where Dr. King was assassinated outside Room 306 on April 4, 1968. 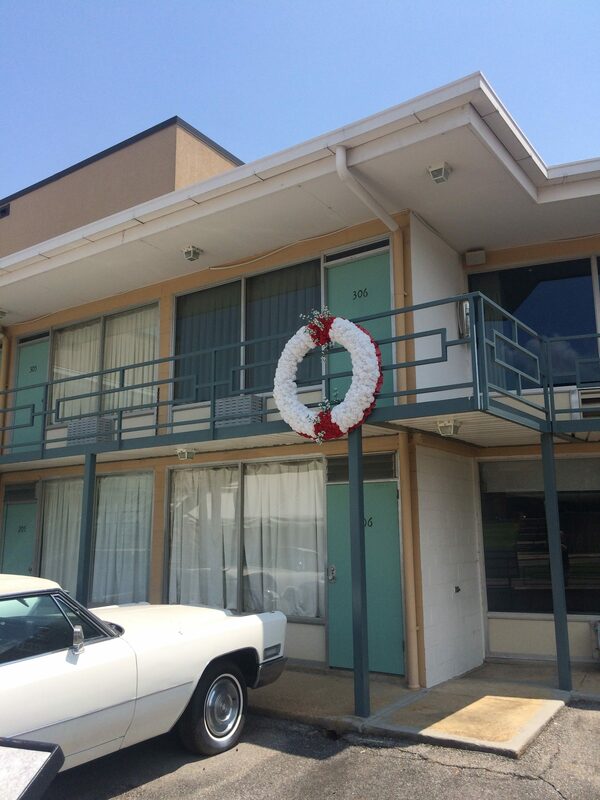 In fact, the museum tour ends with a view of his room as it was on the final day of his life, and a wreath hangs on the balcony railing behind which he fell. Like other museums and memorials, it is not a place to have fun. But it is there to ensure that in these days of global terror, often in the name of religion, we do not forget the home grown terrorism that bombed churches, set buses on fire, and caused countless other atrocities for innocent precious children of God. Go there if you ever have the chance! It’s one of those places from which you cannot leave unchanged. While in the Memphis area we also visited the Museum of Biblical History, which focuses not so much on the bible itself as on the historical context in which the events captured in scripture took place. It’s not a big museum but was worth the time. 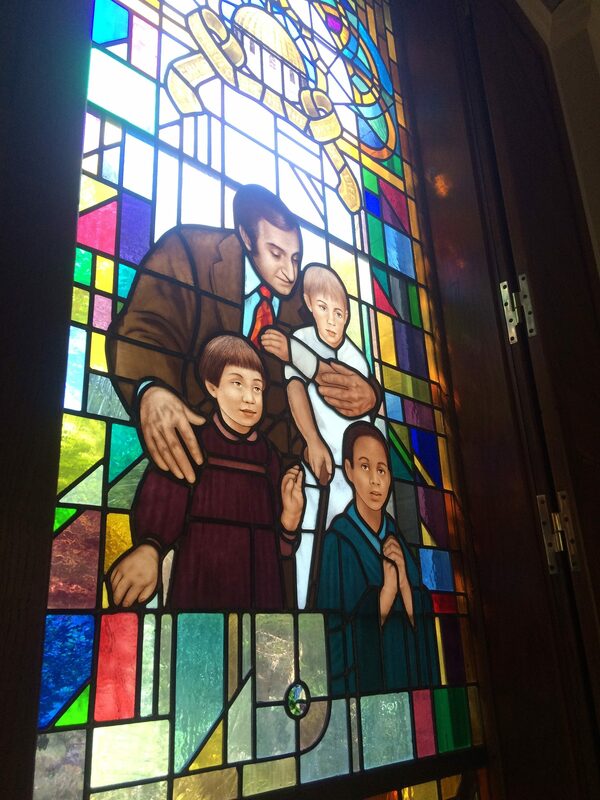 And our final stop before leaving town was at the St. Jude Children’s Research Hospital, where children come from all over the world and its founder, entertainer Danny Thomas and his wife Rose Marie are buried adjacent to the hospital’s chapel and museum. The story goes that with his career stalled, Thomas was living paycheck to paycheck and needed $70 to pay the bill and get his young wife and their newborn daughter Marlo out of the hospital. The devout Christian went to church in Detroit, put seven of his last ten dollars in the offering, and prayed for a means to provide for his family and for guidance in his life. The next day he landed a job as a singing toothbrush in a radio commercial that paid $75 and his career from then on became a smashing success. 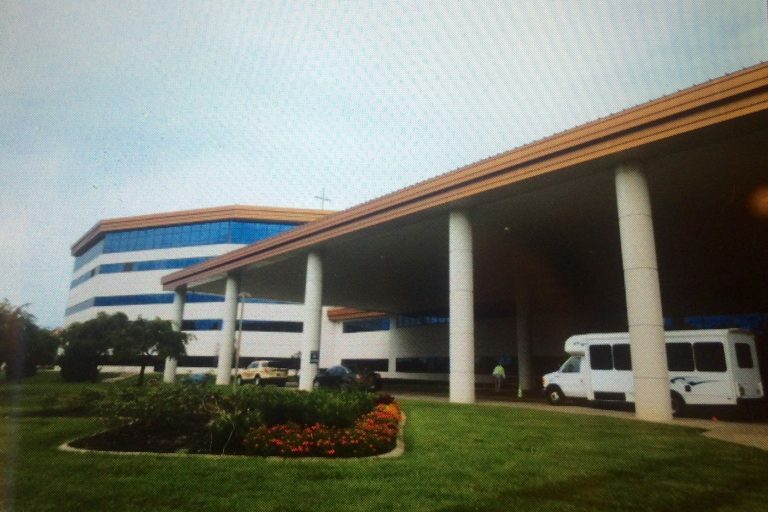 But Thomas never forgot the answer to his prayer and years later used his wealth and celebrity to “give back” and establish a children’s hospital bearing the name of St. Jude, the patron saint of hopeless causes. It’s amazing to think of the difference one person can make in this world when they look to heaven in a moment of need and serve God by serving others with the blessings they’ve been given. From Memphis, we made our way to Louisville with a stop in Nashville and a visit to The Upper Room. Some of you may be familiar with a daily devotional guide by that name, which is published in dozens of languages and distributed throughout the world. What you may not know is that the headquarters of The Upper Room is located in Nashville, and is also a destination of Christian pilgrimage, having grown to become a global ministry which includes other publications, programs, prayer support, and resources to help believers of all ages and denominations move to a deeper level of faith and service. The Upper Room headquarters includes an international Christian art museum, prayer garden, two chapels, and a resource center. 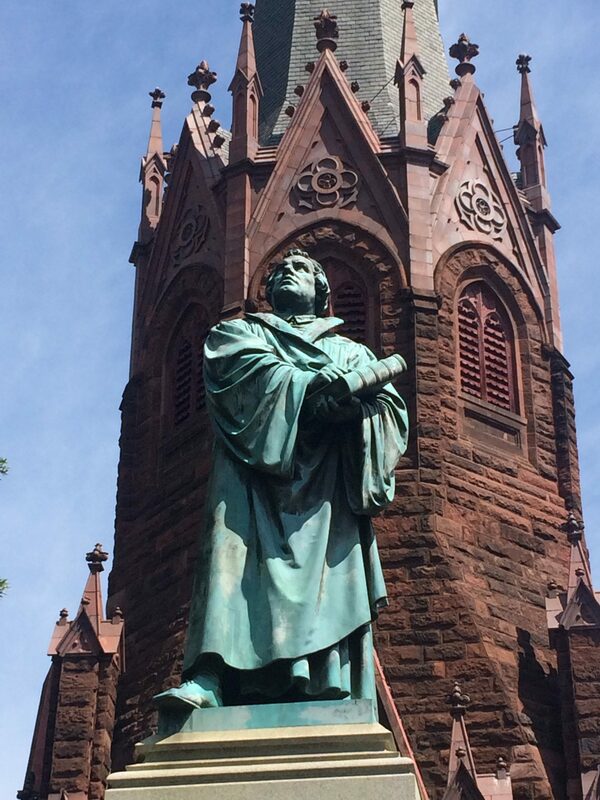 In early August, I assumed the role of student at a course on the Psalms taught by Concordia Seminary’s Professor Tim Saleska at Immanuel Lutheran Church in Charlottesville, Virginia. Though I’ve been reading the psalms all my life, I was amazed by the fresh insights and perspectives I gained from Tim, whose father was a professor of mine more than thirty years ago. It was also great to re-connect with some old friends and make a few new ones as well. Little did I know that just days after leaving Charlottesville, heartbreaking news would be made and life would be lost there because of sinful divisions in the human family against which our Lord so vigorously preached. I couldn’t help but think of those events in the context of our earlier visit to the National Civil Rights Museum in Memphis. Clearly, we still have much to do as God’s ambassadors of peace and reconciliation to our nation and the world. After my study of the psalms, I turned my attention to the task of leadership by attending the annual Global Leadership Summit of the Willow Creek Association. While the conference is faith based, it attracts heads of organizations and business people in addition to church leaders from around the world. Like the course on the psalms, the global leadership summit reminded me that I still have so much to learn about being a servant of Christ, a follower of His word, and a leader in His church. But, I left feeling blessed by a few more steps in that ongoing journey. Finally, there were individual conversations with pastors and other ministers about spiritual life, mission and ministry, and some of the ideas swimming around in my head and heart, and I’m grateful that they too were both instructive and inspiring. Please don’t think that in the midst of the churches and other places I visited or the learning experiences I had during July and August, I wasn’t having fun. I was. While in Memphis, we ate at BB King’s Blues Club and visited the Sun Studio where Elvis made his first record. In Nashville we went Honky Tonkin’ and toured the Grand Ole’ Opry. As I mentioned before, Patty and I vacationed in the beautiful Finger Lakes region of New York. Lauren and I saw Coldplay perform at FedEx Field. There were a few projects around the house, an Orioles game or two, visits to my mother in Pennsylvania, and the return of David and Lauren to their respective schools for the fall semester and in Lauren’s case, graduate study. Last but not least, in July our daughter Andrea became engaged to Joel Gast. Joel is a budget analyst for Johns Hopkins University and serves as treasurer on the Board of Directors of the Lutheran Schools Association of greater New York. However, he is also a fan of the Green Bay Packers, which will obviously constitute a mixed marriage in our family. Nevertheless, Joel is a great guy and a faithful servant, and we are thrilled for them and for us. Meanwhile, Andrea also accepted a Call to teach First Grade at Emmanuel Lutheran Church and School in Catonsville, Maryland, and her late August installation gave us reason to attend worship there as my sabbatical time drew to a close. If you made it this far in reading these reflections, you probably also need a sabbatical. Nevertheless, thanks for getting a sense of my “time apart” and for considering some of the places, experiences, and stories that reminded me that God is real and is working in the world. He has worked through a small group of people who gave birth to a church of 21,000. He has worked through a man who got a job as a singing toothbrush and then, as a response to God’s provision, founded a hospital where children are healed. And He continues to work through visionary followers of Christ in communities of every size and location, including the one to which I have come home again after wandering around for the better part of two months. I hope you will also take time to recall the stories, places, and experiences in your life and in the life of St. Andrew through which God is working for the healing and hope of the world. As we see every day in the news, the conflict between “loving thy neighbor and devouring thy neighbor” has yet to be fully resolved. But in Frank Capra’s words, our “weapon” in that conflict is a “house full of love,” which we know in the person of Jesus and through those who for His glory offer authentic worship in a variety of ways and demonstrate the peace and reconciliation, amazing grace and biblical truth that come from Him. It’s good to be back in such a house with such a family. Thank you once again for allowing me a little Sabbath rest and even some “mindless amusement” as we get back to the great work of going out to bless the world and to call and gather everyone everywhere in to a new home and a new life in the heart of God.